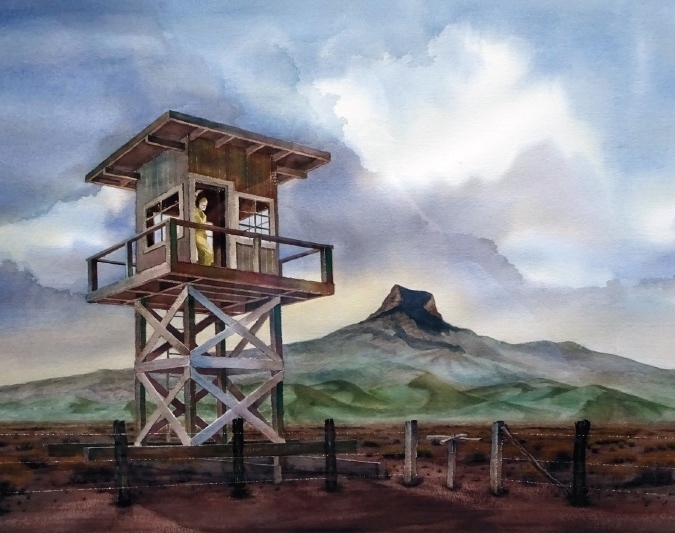 A watercolor by Joe Nakanishi shows a guard tower and barbed-wire fence with Heart Mountain in the background. POWELL, Wyo. — A new exhibit at Heart Mountain Interpretive Center features the artwork of Joe Nakanishi, a former incarceree of the World War II-era confinement site. The exhibit, “Joe Nakanishi: Perspective,” showcases a series of paintings created by Nakanishi over the last 20 years, based on sketches and memories from his time at Heart Mountain. The exhibit runs through May. In 1942, Nakanishi — then just 19 years old — was forcibly removed from his home in Southern California and sent to Heart Mountain. During his incarceration, he spent much of his time observing and recording the world around him in his sketchbook. A guard tower and the camp’s barbed wire fence, both located directly outside of Nakanishi’s barrack room, served as inspiration for several of his drawings. After his release in 1945, Nakanishi eventually returned to California and enjoyed a long and accomplished career as a designer, illustrator, and artist. In his retirement, he was inspired to return to the subject matter of his youth with the series of paintings now on exhibit at Heart Mountain. Russell also notes that Nakanishi is one of the only major artists from the camp still living. He currently resides in Los Angeles. Heart Mountain Interpretive Center tells the story of some 14,000 Japanese Americans unjustly incarcerated in Wyoming from 1942 through 1945. The center is located between Cody and Powell on Highway 14A. Museum admission is $9 for adults and $7 for students and seniors. Children under 12 and members of the Heart Mountain Wyoming Foundation are free. For more information, call (307) 754-8000 or visit www.heartmountain.org.